I was sent a very cool book this morning called New London Style, which features various interesting houses around the city. I want to live in them all! 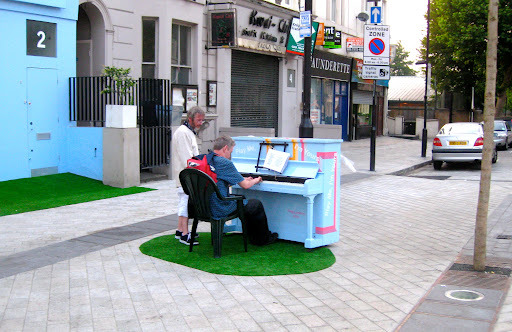 Communal pianos have started popping up in the streets of London and there's one just down the road from us at Maida Hill Market. I can't wait for Tom to have a shot on one. This week has been so hot that it’s been hard to get much work done, so we’ve been hanging out with the almost all of our neighbours and watching Wimbeldon – I didn’t realize how much I liked tennis. Alice Dellal has been recording a shouting song next door, which seems to involve running back and forth to the car to listen to the song on the stereo very loudly. She told Tom that we have a lovely place. Also, if you’re a fan of the London Rollergirls, we've been given tickets for Roll Britannia to give away on Cut Out + Keep.